As an additional note: there is a sticky ‘System Reset Status’ register available (I think on most Kinetis devices) which reports the reason for the reset. A good idea is to read that register at startup time and e.g. 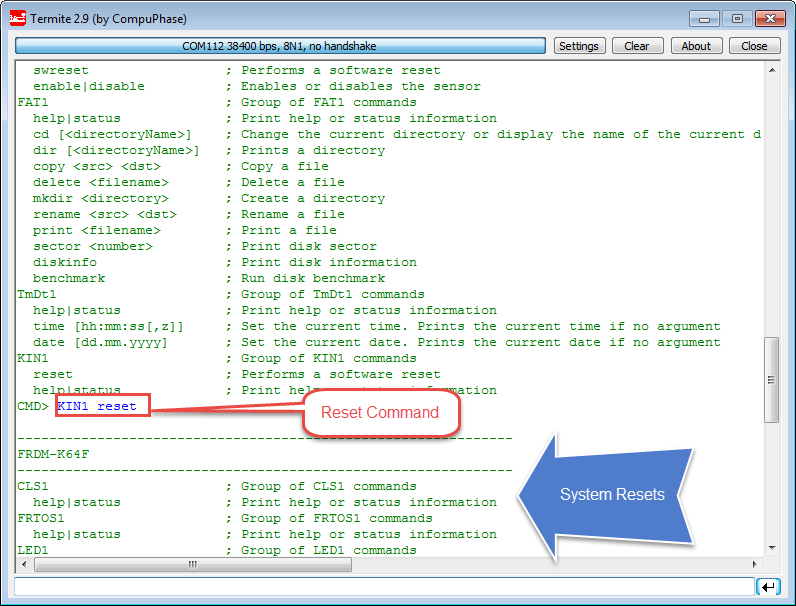 print the reset reason to the console (Thanks Charles for that cool idea!). This entry was posted in ARM, Boards, CPU's, Debugging, Embedded, Embedded Components, Freescale, HCS08, Processor Expert, S12, SDK, SourceForge, Tips & Tricks and tagged Debugging, Embedded Component, Freescale, Processor Expert, technology, Tips&Tricks by Erich Styger. Bookmark the permalink. Great bit of info. Thanks. Great information Erich. Thank you. I had a query. Is it applicable to ARM cortex M4 as well? yes, it applies to ARM Cortex M4 as well. Yes, true. But only if using the CMSIS and if that is provided by the vendor, which is not always the case. I am extrapolating from this that KDS provides no command to reset the processor from either the menu system or the toolbar? I have spent most of my career using classical embedded tools and am still sometimes taken aback by the things Eclipse cannot do. 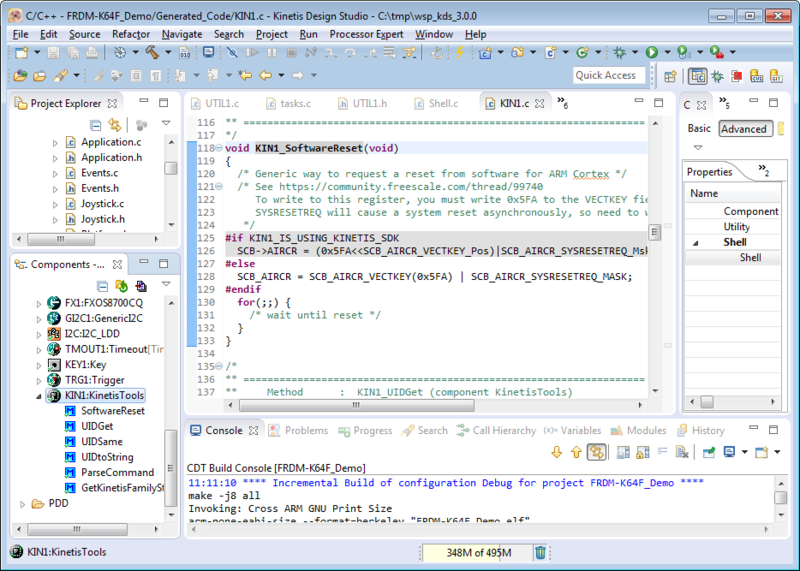 I have used one other Eclipse derivative (Code Composer Studio) and that feature was built in. of course KDS can reset/restart the microcontroller under debug, so your extrapolation is not correct ;-). This article is about performing a reset from the software/application running on the target, not about how to do a reset with a debugger. May I ask, then, where it is? I have made several attempt to find it, but so far no luck. Ok, I did find that, but the description text: (Restart a process or debug target without terminating and re- launching) was so abstruse, I didn’t recognize it. This reset usualy works for us, but sometimes it doesn’t… I’ve noticed that the user guide says: SYSRESETREQ -> asserts a proc_reset_signal. This is intended to force a large system reset of all major components **except for debug**. What does it mean? Debug means that I am currently debugging using a JTAG, or does it mean that I am running a “debug” configuration compiled image? 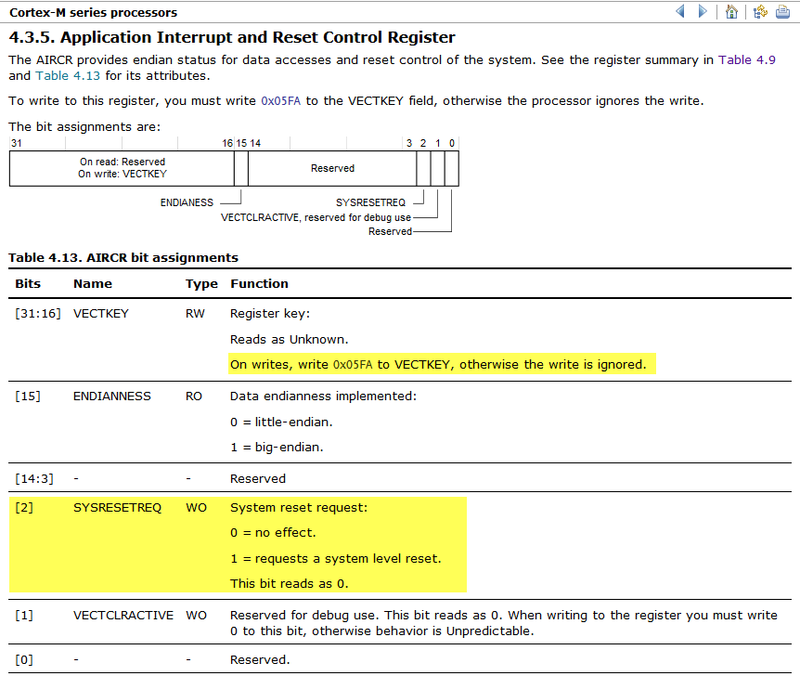 VECTRESET & VECTCLRACTIVE, which we should reset whenever we write to this register, “otherwise behavior is Unpredictable”. Can this be the case…? it means that it does not reset the debug logic on the chip (has nothing to do with hardware). I have not seen any issues on my side with the proposed way. SYSRESETREQ is cleared by a system reset, which means that asserting VECTRESET at the same time may cause SYSRESETREQ to be cleared in the same cycle as it is written to. This may prevent the external system from seeing SYSRESETREQ. It is therefore recommended that VECTRESET and SYSRESETREQ be used exclusively and never both written to 1 at the same time. So, in other words, is it recommended to clear both bits (VECTRESET & VECTCLRACTIVE) at the same time that I set SYSRESETREQ – in order to prevent it to interfere with the reset action? I’ve noticed that maybe there is another option for Cortex-M3, which is to use RSTC_CR. Have anyone tried this option? HI! I had a problem with de watchdog. I initialize the watchdog, I do not refresh in the loop and the core doesn t reset. All the registers are initialize ok beacause y see them in the debuger. ¿Does anyone know if there is another register to enable the clock or something similar? Which device, and which debugger? The watchdog functions depend on the device implementation, and I have seen debuggers which disable the watchdog (so you can debug). Do you have the same if you run the board without the debugger? If I tick the checkbox to use a shell (and add the required components for that) then it builds just fine. The problem seems to only occur when I try to use the KinetisTools without a shell. Any suggestions? Just checking: Are you using the latest version (https://mcuoneclipse.com/2017/09/25/mcuoneclipse-components-25-sept-2017-release/)? Yes, I just installed the mcuoneclipse components (latest version) when I tried this. hmm, I’m not able to reproduce this. Would you mind to send me your project (I don’t need the source files to my email address listed on https://mcuoneclipse.com/about/ so I can try to reproduce this? got it, thank you, looking into it as soon as I can and will respond to you. The given information is useful foe me, i wanted to read the reset reason as well. i have tried to read the reset reason using the CPUDBGSCRATCH register, but in the this memory (0xe010200c) always i can see 0xFFFFFFFC values. can you please suggest how exactly i can read the reset reason. I’m working with power modes and using FRDM-KL02z board, I tried to use this method to exit the stop mode, I wrote “KIN1_SoftwareReset();” after calling the enter stop mode function but it is not working. Do you have any idea why it is not working ?as I’m expecting to exit the stop mode into normal run mode. I have not used it in such a sitution. But if you are in stop mode, then no instructions get executed. So you need first to exit stop mode and then do the reset? Yes, I need to exit the stop mode into the normal run, this can happen by either using reset or interrupt(WFI). I’m not sure how to use the WFI so I’m thinking if there is software reset code that let the M0+ exit the stop mode? Yes, I tried ” __asm(“wfi”);” but didn’t work, my code is simply as below, I tried to place the “__asm(“wfi”);” after and before calling the enter stop mode function, do you have any idea why? your usage of WFI looks ok. All what you need then to continue after that instruction is to raise an interrupt (e.g. with an external pin interrupt). WFI does exactly what its name is: it waits and sits there until an interrupt occurs. You have to enable interrupts *before* executing wfi. I enabled the wake_up_int and then checked the wakeup_flag in events.c and then called the deepsleep function which is the same as in the above post but still has the same issue, the MCU enter the stop mode any stay there 🙁. The interrupt to wake you up has to be turned on *before* you enter the stop mode.